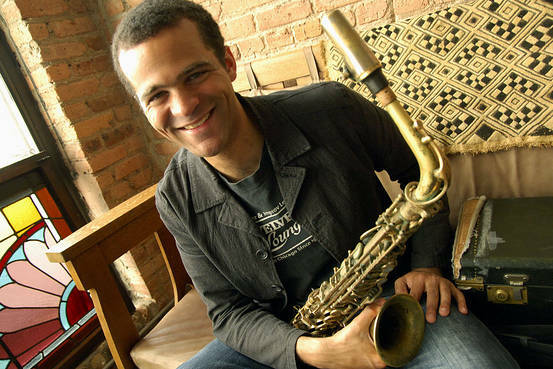 Alto saxophonist Greg Ward got a lot of attention for his album Touch My Beloved Thoughts a couple of years ago where he wrote a suite inspired by Charles Mingus The Black Saint and the Sinner Lady (1963). A lot of the praise was probably due to the critics’ familiarity with Mingus’ music. My guess is that Ward’s new album of original music will get a lot less attention, which is a pity since it is a very good album. There are bridges between the two albums in Ward’s playing and writing but the instrumentation sets them apart. On the former album Ward worked with an acoustic band with a full horn section in the spirit of Mingus’ music. On the new album he works with a band with two electric guitarists and a rhythm section. The difference in sound is something like Sketches of Spain compared with In A Silent Way. I very much like the sound of his band Rouge Parade. I can not tell the two guitarists Matt Gold and Dave Miller apart, but rather hear them as producing a collective sound a bit like the multiple pianists did on Miles Davis’ In A Silent Way. They do not crowd each other but leaves a lot of room for each other, Ward and the rhythm section. Bassist Matt Ulery is most impressive. On “The Contender” he pushes the whole band with a fast-steady pulse. On the less aggressive medium tempo song “Pitch Black Promenade” he produces an independent melodic bass line which works as a counter point to the guitar lines. Drummer Quin Kirchner listens closely to the ensemble and adjusts his style to the ebb and flows. He is never overpowering even if he keeps himself busy. Ward himself has written another very good set of music and he improvises in a melodic style which can remind a bit of Lee Konitz’s way of playing. He like the other band members also seems to have the sound of the band more in focus than being a star soloist, even if he is able to. They even manage to get the old standard “Stardust” to sound modern even if they stay close to the original melody. It is a band with a lot of potential and this album by Ward leaves me interested in where he will go from here.